Depending on which octogenarian you ask, the question "What did you do during the war?" may unlock long-forgotten stories of wartime privations or personal embarrassment. Jimmy Chew Kian Tong apparently had no such hang ups. As a teen, he served Britain's Royal Air Force (RAF) as an aircraft technician 70 years ago in the futile struggle against Imperial Japanese forces, who invaded and occupied Singapore between 15 February 1942 till the war's end. Captured by the Japanese, he was held as a prisoner of war in Java (then occupied Dutch colonial territory) for his part as a combatant. After World War Two, Jimmy Chew was one of the first people from this island to earn his pilot wings with the Malayan Auxiliary Air Force (MAAF), which was formed with the aim of training pilots from British Malaya to RAF standard. 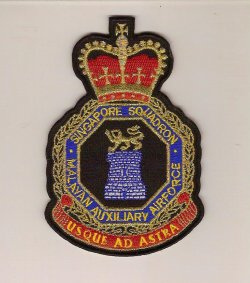 Trained at RAF Tengah (now Tengah Air Base), Jimmy Chew rose to the rank of Squadron Leader (almost in the same tier protocol-wise as a Republic of Singapore Air Force Major). Jimmy Chew would probably have hours of yarns to share about his wartime ordeal and MAAF experience. Oral history specialists have done their best at data mining and scattered references for Jimmy Chew can be found through Google. Skilled interviewers could probably draw out more. But it's too late as Jimmy will be laid to rest this afternoon. He died last week at the age of 88. He leaves behind two sons, three daughters and three grandchildren. His death marks the passing of one of the last WW2 POWs from Singapore. At a time when this island was in trouble, people like Jimmy Chew bravely stepped forward to resist the aggressor. Acknowledgement: I thank the RSAF officer, who evidently knows his military history, for bringing Jimmy Chew's passing to this blog's attention. I think I remember him. He was featured Lianhe Zhaobao many years ago when I was a kid. I tried to find him online since then, but no avail. Now I know who he is. Thank you. RIP. He was just being featured last year in a documentary show in CNA. We shall not forget.